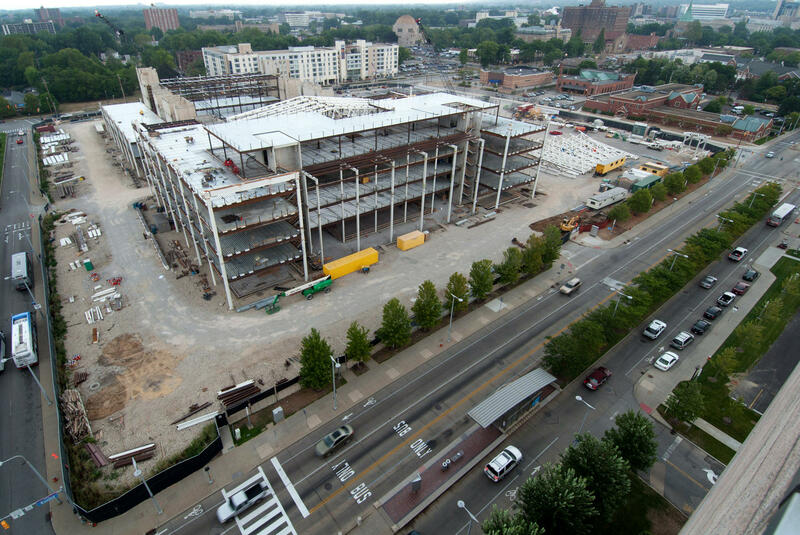 A project now under construction in Cleveland will eventually house the Case Western Reserve University's medical, dental and nursing schools, as well as the Cleveland Clinic's in-house medical school. The skylight is part of the new Case Western Reserve University Health Education campus. The joint project with the Cleveland Clinic will eventually house the Case Western Reserve University's medical, dental and nursing schools, as well as the Cleveland Clinic's in-house medical school. When it opens to the first classes of students in 2019, it will provide an estimated 8.5 football fields worth of space and enough concrete to build a sidewalk that's 75 miles long. The cost: almost $500 million. "The idea is to create a 'mini campus' that gives each school its own identity but fosters collaboration," says Chris Connell, one of the architects, who is with Foster & Partners. Collaboration is the ultimate goal, those involved in the project say. Health care in the 21st century is increasingly being provided by teams, yet most health care professionals don't encounter their "teammates" until they are well along in their training. "Health care is no longer a gladiatorial sport, where you had the one health care provider — you know, mano a mano, one on one — battling a disease," says Dr. James Young, a cardiologist who heads the Cleveland Clinic Lerner College of Medicine. "I'm involved with heart transplantation and mechanical devices for the heart," he says. "Boy, you can't do it by yourself!" The new building, however, is less the beginning and more the culmination of a long-running effort at Case to train different types of health professionals together. As construction workers pour concrete and erected scaffolding, about a mile down the road at the Case main campus, a small group of students from the schools of medicine, dentistry, nursing and social work gather around a table in a conference room. Their mission: to figure out how to best treat their pretend patient — a 35-year-old woman with hypertension, obesity and diabetes. In the hypothetical scenario the students have been asked to work through in this training exercise, the patient has come to their clinic with a series of injuries she says she got falling down a flight of stairs. Meanwhile, according to the scenario, her boyfriend is in the lobby acting disruptively. The students discuss and argue about which of the patient's problems to address first, and what to do about the boyfriend. They don't end up reaching much of a consensus, but faculty members overseeing the group say that's OK.
"I think that's fabulous," says Kristin Victoroff, an associate dean at the dental school. "It is actually an indicator of a functioning group, where there's enough trust in the group where you can say what you really are thinking." The twice-a-year seminars aren't the only collaborations that bring students from different health professions together. At an oral health clinic in Cleveland, for example, nurses and dental students work together to treat real patients. Other activities bring students together to discuss interdisciplinary problems — like obesity or pain. "We all have to deal with pain whether [we're] dentists or social workers or nurses," says Carol Savrin, a nurse practitioner and senior administrator at the Case nursing school. "So they're taking a common thread and coming at it from a variety of different angles." This approach isn't new. Efforts to train doctors, nurses and other health professionals together have been tried for years. And they haven't always been successful. "I think they come in with some preconceived or stereotyped notions of what a doctor [or] a social worker is," says Scott Wilkes, an assistant dean at Case Western's school of social work. Breaking down those stereotypes by giving students from various disciplines a place to hear other perspectives and different types of knowledge, in their earliest training days, could make a difference, proponents of the new joint campus say. Getting everyone on the same page when that happens is critical to preventing medical mistakes, says Dr. Patricia Thomas, an internist and vice dean overseeing medical education at the Case Western Reserve medical school. In studying the problem, she says, "the root of many of our errors had to do with the fact that our professions were not working effectively together for patient care." Update at noon ET: This post should have noted that the Cleveland Clinic is among NPR's financial supporters. Kaiser Health News was not aware of that. In health care, they say it's all about the team - doctors, nurses, others working together to treat patients. But for the most part, they still train separately. Well, in Cleveland, two big health organizations are trying to create a structure that encourages teamwork. Julie Rovner has the story. JULIE ROVNER, BYLINE: There is a new building going up on the campus of the Cleveland Clinic, a really big building. RUSS SAGHY: The skylight that we're standing under will eventually cover the area of an entire football field. ROVNER: That's Russ Saghy, who oversees construction projects for the Cleveland Clinic. He's talking about the new Health Education Campus for Case Western Reserve University. It's a joint project of the clinic and the university to the tune of half a trillion dollars. The building eventually will provide eight and a half football fields' worth of space and house four separate training programs - the Case Western medical, nursing and dental schools and the Cleveland Clinic's own in-house medical school. It's a move that reflects a change in the nature of medical care itself. JAMES YOUNG: Health care is no longer a gladiatorial sport where you had the one health care provider, you know, mano a mano, one on one battling a disease. ROVNER: That's James Young, who heads the Cleveland Clinic school of medicine. He says medicine in the 21st century has become so complex that teamwork is a necessity. YOUNG: I'm involved with heart transplantation and mechanical devices for the heart. Boy, you can't do it by yourself. ROVNER: The new building is actually the culmination of ongoing efforts at Case to train its health care teams together. For years now, it's been bringing together students from medicine, nursing, dentistry, social work and public health. For example, the university has a free oral health clinic that puts dental and nursing students side by side treating patients. Carol Savrin, an administrator at the Case nursing school, says the various health schools also have joint projects around specific health problems - obesity, for example and pain. CAROL SAVRIN: We all have to deal with pain, whether it's dentists or social workers or nurses. So they're taking a common thread and coming at it from a variety of different angles. ROVNER: Students from all the disciplines also come together twice a year for mandatory workshops, where they role-play through various patient scenarios. Scott Wilkes, an assistant dean at the Case Western school of social work, says this generation is particularly well-suited to teamwork. SCOTT WILKES: They get it. When they're in the room together and they're talking with one another, they understand how important this is. ROVNER: That's a good thing because efforts to train doctors, nurses and other health care professionals together haven't always produced the best results. In many cases, students have been just as quick to adopt stereotypical roles as their more-trained elders are, says Wilkes. WILKES: I think that they come in with some preconceived or stereotype notions of what a doctor - a social worker is. ROVNER: Yet, Patricia Thomas, a vice dean at the Case medical school, says closer knit teams are necessary, among other things, for preventing medical mistakes. PATRICIA THOMAS: The root of many of our errors had to do with the fact that our professions were not working effectively together for patient care. ROVNER: Thomas concedes that no one is exactly sure how to train health professionals effectively to work in teams. THOMAS: It's true. We don't have a great evidence base for what works. ROVNER: But having students cross paths, not just in their formal schooling but in more relaxed areas of the new building, will foster the team spirit they're trying to build, says nursing administrator Savrin. SAVRIN: It needs to be reinforced. So we can teach these people about each other in year one, but they need to keep reinforcing that throughout the four years of their education. ROVNER: The first students are scheduled to move to the new building in 2019. I'm Julie Rovner. GREENE: Julie Rovner is with Kaiser Health News. [POST-BROADCAST CORRECTION: We mistakenly say that the Case Western Reserve University Health Education campus will cost half a trillion dollars. In fact, it will cost almost $500 million - or about half a billion dollars.] Transcript provided by NPR, Copyright NPR.